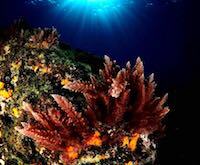 Reach the limits of recreational diving. Whether its a shipwreck, a canyon or a deep-water eco-system, the lore of the deep can be strong and with Deep Diver speciality you are right to the limits of recreational diving qualified to dive to 40 metres, prepared for the physiological effects and special equipment requirements. With a huge range of cameras, Underwater Photography has boomed over the years becoming once of the most popular specialities. As you probably realised, simply pointing the camera and expecting the photo to look the same as what your eyes saw is no simple matter. 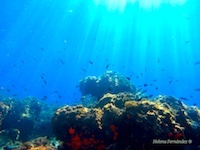 The course is designed so that you can get the most out of your underwater snaps. Perfecting your position, weighting and understanding how not only do you lungs play a huge part in buoyancy control but the most fun part. With buoyancy mastered like a natural sea creature your air consumption will fall dramatically meaning that never again will your air supply reduce your dive time. Sometimes a dive site is just too good but you’ve reached the maximum time you can spend at that depth. Nitrox changes everything increasing your total bottom time by offsetting the effects of nitrogen at depth. While the course as a few challenges, diving with enriched air means that never again will that dive be just that bit too short. Dive with an underwater scooter. Ever wanted to get around underwater at speed? Or have a load of fun with a submersible scooter? Diver Propulsion Vehicle is a game changer for those needing or just fancying a little more speed. Propel your way through the water, glide over reefs or buzz around a large wreck. Learn to use ocean currents and river flows to glide through the water and fly across a dive site. Drift diving is as exhilarating as it is relaxing, decreasing your air consumption as you go with the flow. How to find everything underwater! Wondering how your Divemaster was able to find that moray? Or how they led the group around a complex dive site knowing exactly where the boat would be at the end? Take on the challenge and become an Underwater Navigator developing your observational and practical skills so that you can get the big rewards as well. Qualify to dive to 40 metres with the Deep Speciality diving right on the edge of the limits of recreational diving or increase your bottom time by learning about and diving with Enriched Air (Nitrox). Experience first-hand the techniques to take the perfect underwater photograph and how to restore the look and feel of the environment you saw in post-production. If weightlessness is your thing then, perfect the art of perfect buoyancy control and learn to glide across dive sites in full control of every movement. 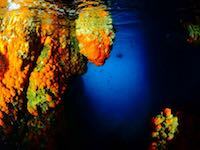 Buoyancy control is an absolute game changer from reducing your air consumption to getting the most out of dive sites. Ever wanted to try out an underwater scooter? With a diver propulsion vehicle you can jet around the underwater world opening up new possibilities for dive site exploration. 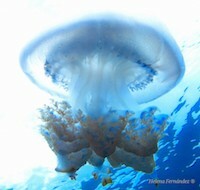 If you’d prefer you could also experience the thrill to be had from drifting in underwater currents. Learn advanced navigation techniques for more challenging dive sites or if you’re looking to dive in colder reaches of the world, get orientated with a dry suit. An adventure through enormous rock formations and boulders inhabited by rich colours of marine life. Meaning ‘the stone of man,’ Piedra del Hombre is an adventure through the sublime geographical layout and immense proportions of the Costa Tropical coastline. With easy immersion and a maximum depth of 18 metres, this dive site lends itself well to Open Water divers whilst providing a unique and interesting challenge to the experienced. The low depth allows for visibility that is second to none. 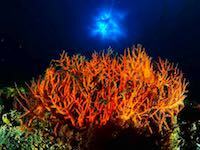 Costa Tropical's flagship scuba diving site with marine life and geography second to none. Twist and turn through plateaus and cliffs at one of Costa Tropical’s most beautiful coastal locations. From large pelagic fish, such as groupers, sea bass, mackerel, pollack, dentex, golden and moonfish to conger eels, moray eels and larger octopus, Punta de la Mona is an emblematic of Spain’s tropical micro-climate and extraordinary dive site. 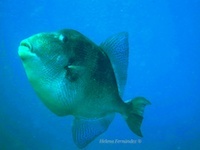 Dive across the large natural area between Cerro Gordo and Cantarrijan. Located within the Natural Area between Cerro Gordo and Cantarrijan, with a maximum depth of 21 meters and averaging between 16 to 18 meters. 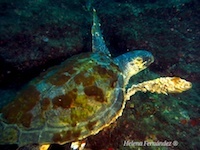 Huerta is an exhilarating dive for divers of all levels. 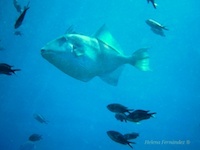 Discover the diverse range of marine life with an adventure through colonies of different species. 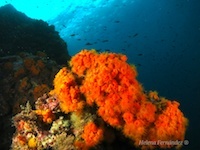 The star species of this location is the beautiful and large specimens of orange coral Dendrophyllia ramea. Anchoring to the west of small rocky bay the dive site begins at 8 meters with large lobsters, pollock and grouper inhabiting the surroundings. 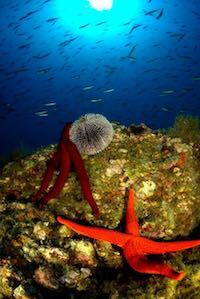 From here the dive deepens to delicate and intricate colonies of briozzos, species of annelids and echinoderms. An astounding oasis where divers experience the complexity of the underwater ecosystem. 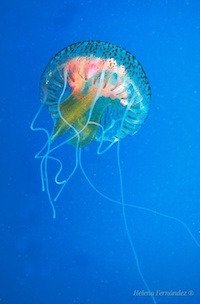 Experience the complexity of the a highly sophisticated underwater ecosystem where life, small and large, live as predator and prey in complete symbiosis. 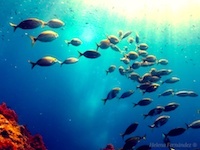 Here divers observe marine life in its most natural state and environment. From golden anemones to octopuses, flying fish, trigger fish and groupers to to prawns, golden anemones and eels this dive site is a beacon of life. Dive on the edge of La Herradura’s national park. 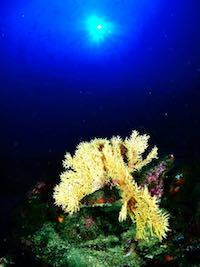 For diversity of marine life, Calaiza delivers and experience into what makes Costa Tropical special whilst being suitable for all diving levels. 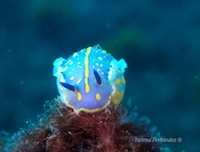 Highly concentrated with macro life, Calaiza holds large numbers of nudibranchs such as Chromodoris krohni, Thuridilla hopei, Crimora papillata, Polycera quadrilineata and Fabellina affinis as well as preying cuttlefish and octopuses. A wooden shipwreck populated with marine life unique to the area. Among the most noteworthy of marine life at this site there are conger eels, flatfish, Herreras, pageles, groups of bogas, corvinas and kings as well as invertebrate fauna bryozoans, small spider crabs, spirographs, salmancina, protids, snakes and sponges. Squid layings have also been observed repeatedly although we have never observed these beautiful animals in the area. See if you can find them for us! A journey through the pinnacles and rock formations to the edge of Punta de la Mona. Located on the edge of Punta de la Mona, Cueva del Jarro offers an intricate experience navigating around all the geographical formations, caverns, nooks and crannies. Starting with a wide cave entrance 10 meters deep, the dive runs from 16 meters all the way to 38 meters twisting around the outer edges of the coast. Large mammals have been found to lurk within the large rocks and overlapping stones. Experience a variety of caves across a rocky adventure dive. The dive begins with a large vault guiding divers in to the largest and most beautiful of the caves that the area houses. The second cave is only a few metres from the surface with marine life seeking refuge from the sea. It provides direct access to the deepest cave which is filled by fresh water that causes a tingling sensation.